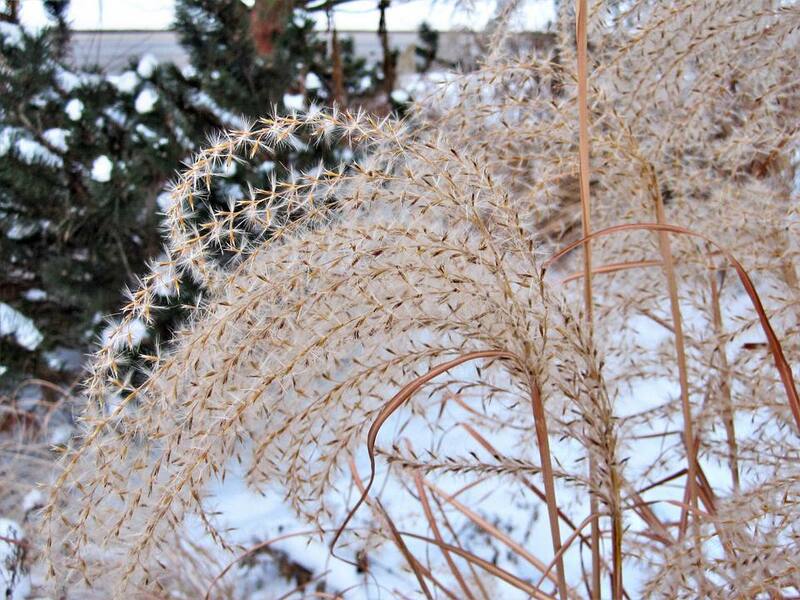 It's a matter of personal choice whether you cut back your ornamental grasses in fall or spring. Many ornamental kinds of grass will remain attractive if left standing throughout the better part of the winter. They may even provide food for the birds, but they may also provide shelter for mice and voles. If you do choose to leave your ornamental grasses standing, you will want to cut them back by early spring, before the new growth begins to grow into the old blades and makes it impossible not to cut back both. Photo: © Marie Iannotti (2008) licensed to About.com, Inc. The more full and beautiful an ornamental grass is, the messier it is when cutting down. To lessen the mess of long grass blades spilling throughout your garden, use this quick and easy technique for cutting back ornamental grasses. Start by wrapping the circumference of the grass. Any wide tape will do, as long as it's sticky enough to keep a hold on the grass blades. Biodegradable tape is recommended. As an alternative, many gardeners like to use bungee cords. Wrapped tightly, they should hold together long enough to get you to the compost, where you can spring them loose. 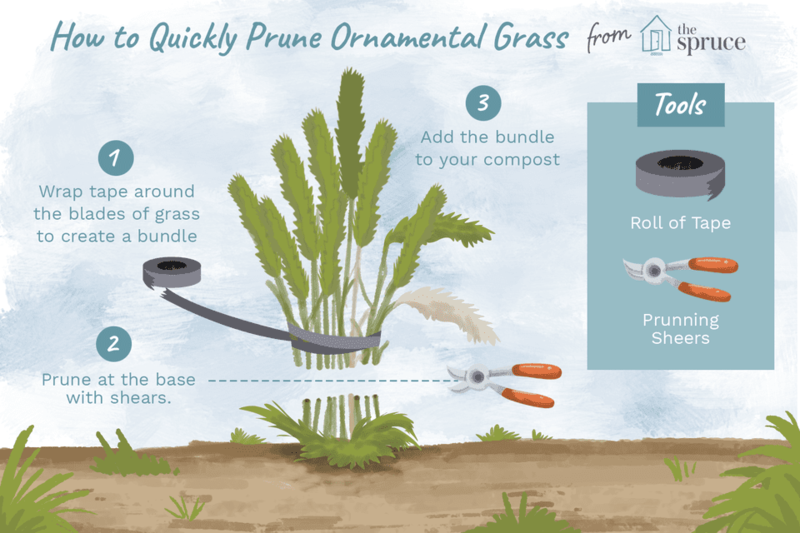 Depending on the width and height of the ornamental grass, you may need to wrap the tape in 2 to 3 positions along the height of the grass and possibly divide the grass blades into 2 to 3 bundles. The grass shown here is relatively young and can be bunched whole. Now that your ornamental grasses are neatly bundled, it's much easier to take your pruning shears and prune the grass back at ground level. The tape is holding the grass blades in place, so you can lean the ornamental grass bundle away from the base as you cut, to make cutting easier. If your ornamental grass is well established, you may prefer to use a power hedge trimmer to do the job. Either way, pre-bundling the grass will make it an easier job than grabbing handfuls of grass blades and hand pruning. Now all you are left with is a neat and tidy ornamental grass bundle. There will undoubtedly be a few renegade blades to clean up, but nothing like the messy sprawl it could have been. Picking up the ornamental grass bundles to take to the compost pile is an easy enough task, but removing the tape can be a major hassle. Use a good quality paper masking tape rather than a vinyl tape. The masking tape may tear more easily, so you will need more of it to hold the ornamental grass bundle together, but you can then toss the whole bundle into the compost and not worry about the tape remaining there forever. Of course, you can always sieve out the vinyl tape, so don't waste your patience trying to remove it before composting. How Do You Pinch, Deadhead, and Cut Back in Your Perennial Garden? What is The Process for Making Plants With Cuttings?